October 4th was a big day for Google as they announce a lot of new technology products coming to consumers very soon. Read more about what they released here. 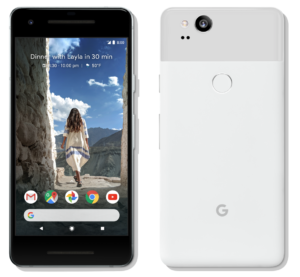 As always, Google likes to compete in the smartphone market by partnering with a flagship partner every year to create their own smartphone(s). This year, like in some years past, HTC was the partner picked. 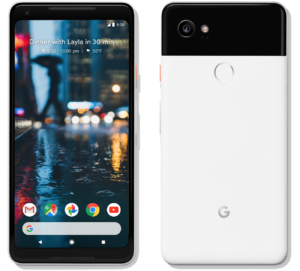 Google decided to build 2 versions of their phone: a 5 inch smaller version, labeled the Pixel 2, and a 6 inch bigger version, labeled the Pixel 2 XL. Most smartphone manufacturers are moving to build a small and big version of their phones as that seems to be the trend now-a-days to best suit the consumer for whichever they prefer. The lowest costing $649 and the highest spec costing $949 and different pricing in between based on which phone and storage amount you choose. Both are specced really well and will be a great smartphone for anyone looking to upgrade or switch from their current one. The one thing to note is these phones copy Apple’s phones in losing the headphone jack, so you will need an adapter if you do not have Bluetooth enabled headphones. 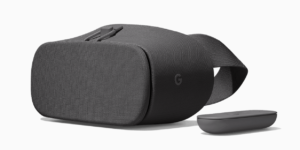 Kind of a novelty, the Daydream VR Headset gets a refresh this year for your new Pixel 2 or Pixel 2 XL (or other day dream enabled smartphones). Coming in 3 different colors for $99, this helps jump you into VR games and apps. Other cool things include the ability to watch youtube in your bed at full screen. The VR scene has yet to fully blossom just yet, so for now, this device is just one of those “extras” you could buy, but could live without. 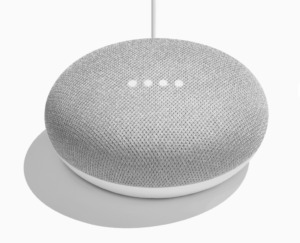 Almost copying Amazon’s Echo Dot, Google has created a Mini version of its Google Home Smart Speaker. The Mini comes in at $49 and 3 different colors. I haven’t had the pleasure of using “Ok Google” that much as I have an Echo Dot at home, but I must say whichever smart speaker you decide to go with, they are really worth it. They help you not only play music and answer questions at a whim, but also help with home automation. If you enjoy shopping with Amazon, I recommend picking up one of these instead. 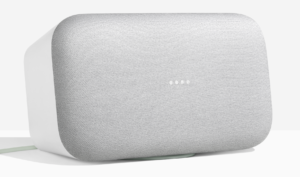 Going to the max, Google also created a Max version of its smart speaker. Really, this was built for the music enthusiast looking for a great speaker; the Google Home Max fits the bill. The only downside is the price of $399…ouch, but hey if you love music and want to make the investment, feel free. 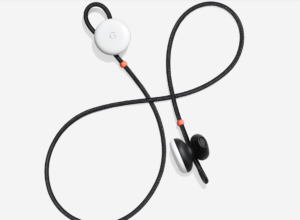 To compete with Apple and their AirPods, Google has released their own Wireless Headphones, dubbed the Pixel Buds. Coming in at $159, these buds do however have a neat feature of helping translate actual conversations to your chosen language. The translator is still brand new and probably going to be in development for the next few years, so don’t expect it to fully work out of the box with every dialect spoken. 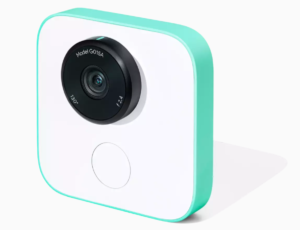 Something out of left field was also announced…the New Google Clips camera. Designed to snap short clips for you when you deem the time necessary to do so. Think of when your child did something cute and your cell phone was far away from you or charging and you’re about to miss taking that great photo or clip. This device is for purposes like that. It contains 16GB of storage and allows you to share the photos when you want and store your photos on Google’s Photos app. The price tag is a bit to swallow for $249, but if you want to be ready to capture those most precious moments, you might want to pick one of these up. Finally on the docket was the Pixelbook, a new stylish and powerful Chromebook. Featuring 4 different ways to use it (laptop, tablet, standing using its keyboard side down on the table and standing using it as a tent like pictured). There are a couple of disappointments though with this device. For starters is comes in a starting price of $999. Usually chromebooks tend to be cheaper than normal laptops, but this one is right up there with normal laptops (granted it is a bit more premium than a normal chromebook). Having a 7th Gen Intel Chip is kind of confusing since Intel has already released the 8th Gen chips already. 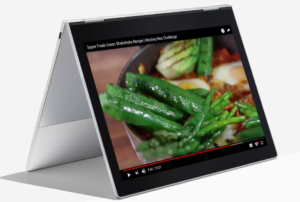 Laptop makers have already announced new products coming to the market around the same time as this device with the newer processor.